Here are some facts about Yuri Gagarin, the Soviet cosmonaut. Yuri Gagarin was born on 9th March 1934 near Gzhatsk in what was then the Russian SFSR, Soviet Union. On 12th April 1961 he became the human in to travel in outer space. His flight lasted just under two hours. In this time he orbited the Earth once in his Vostok 1 spacecraft. Although Vostok 1 did have manual controls, it was flown in automatic mode for the mission. Yuri Gagarin’s call sign was Kedr (Russian for Cedar). Gagarin was selected to undertake the mission because he was small enough (5’2″) to fit inside the cramped cockpit of the Vostok spacecraft, because he was fit and because he had an outstanding memory, good reflexes and was incredibly focused. .Yuri Gagarin played both basketball and ice hockey. 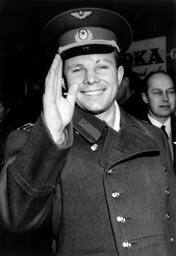 Yuri Gagarin gained celebrity status following his return to Earth. He travelled the world promoting the Soviet Union’s achievement. He spent several years working on designing a reusable spacecraft for the Soviet Union and he was made a Colonel of the Soviet Air Forces in 1963. He was a fighter pilot before becoming a cosmonaut and he continued to fly jet planes in the 1960s. On 27th March 1968 Yuri Gagarin died while piloting a MiG-15UTI plane from Chkalovsky Air Base. The plane entered into a spin that couldn’t be controlled and it crashed. He was only 34. Yuri Gagarin’s body was cremated and his ashed were buried in the Kremlin’s walls. When Neil Armstrong and Buzz Aldrin landed on the surface of the Moon they left medals commemorating Yuri Gagarin. Yuri Gagarin’s face has appeared on Russian coins and numerous postage stamps. Gagarin was named a Hero of the Soviet Union. Because he was Russian, Yuri Gagarin was called a cosmonaut. American space travellers were called astronauts. This helped me out with my National History Day project! Thank you so much! These facts helpfull for my biography!